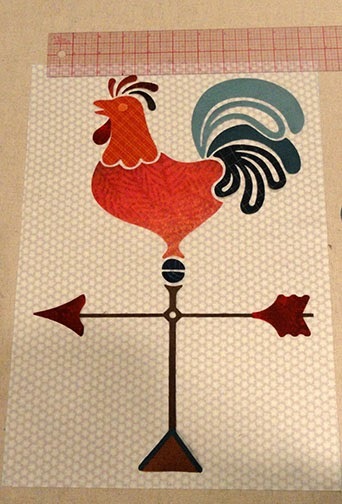 The March panel quilt, "Rooster Vane & Shamrocks"
and as a published print pattern from hearthsewnpatterns.com. While some of the steps described here will be specifically for the cuttable version, constructions beyond the "cutting" steps will apply to either. Step 1. 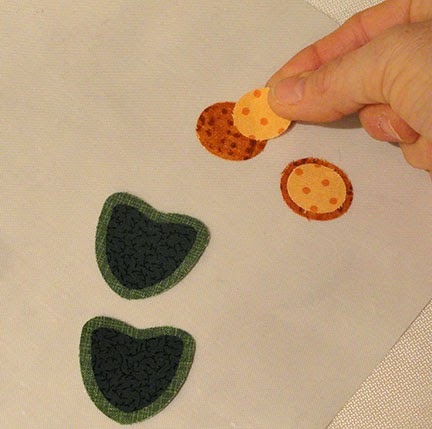 Prepare to cut the fusible applique shapes. 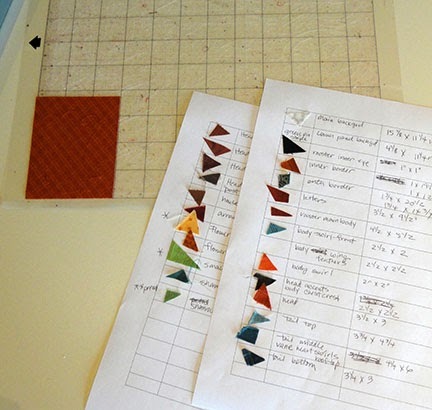 I manage this by making a quick swatch chart with the shape description and a place to pencil in the size requirements for the shape or shapes to be cut. You can determine what size you need to cut for the shape being cut from a specific fabric by positioning and rotating the shape for efficient use of the space. 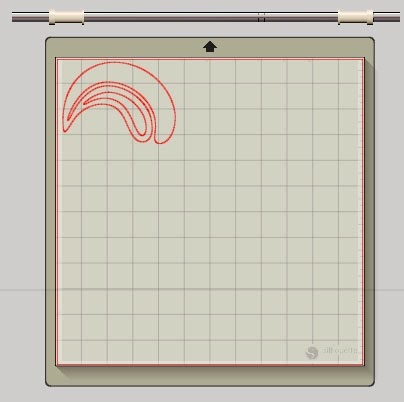 In this screen shot of my Silhouette 12x12 mat, I have used the "Page Tools" to adjust the slider in "Reveal cutting mat" so that I can see the 1x1 grid. Now I can see the spacial area that my fabric should cover in order to successfully cut my shape. According to the grid, I can cut a piece of fusing approx. 5" wide x 4" long, apply it to a matched size fabric patch, and position it in the same mat area. You can also "select" the shape, read the size notations that appear in its "bounding box", then add 3/4"-1" overall to each dimension for fusing and patch sizes. 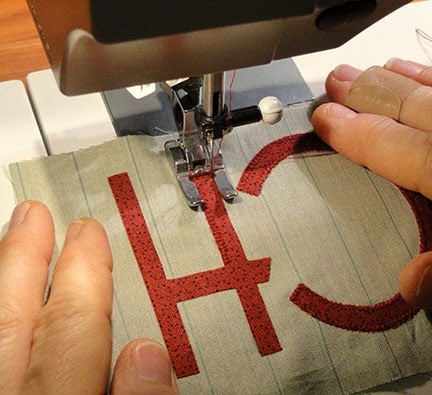 For multiple patches being cut from the same fabric, arrange those shapes together with small margins between to allow the blade to cut the fabric and shapes, then follow similar procedures to determine required sizes. Step 2. Cut the upper panel fabric: 11 1/4" x 15 7/8". Cut the "MARCH" lower panel fabric:11 1/4” x 4 1/8”. 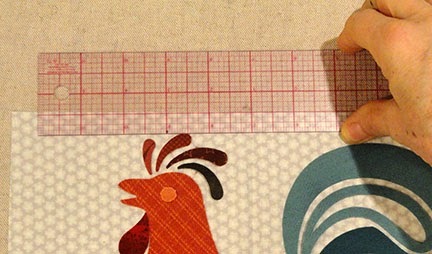 Here you can see me using a see-thru ruler with the 1/2" cross lines at panel edge, and ruler edge at comb applique edge. Arrange all "first layer" shapes, make adjustments if necessary, then press to fuse in place. Step 4. 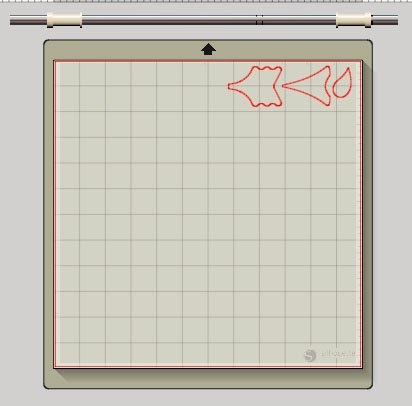 Arrange remaining rooster and vane shapes. Then fuse in place (follow product directions). 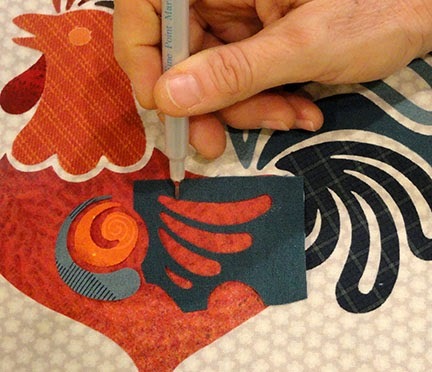 TIP: This image shows how the wing "swoosh" shapes can be grouped from the original download file, moved as a unit to be cut on the mat, then the "weeded" discard fabric shape used to help transfer the three shapes' positions to the rooster body. You could also cut a paper/card stock template of the original arrangement to accomplish this same thing. Step 5. 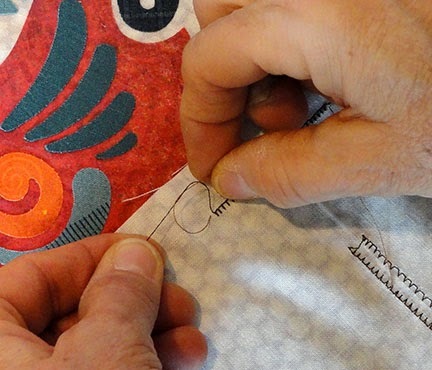 Once the shapes are fused completely, use matching color thread to stitch over the raw edges. 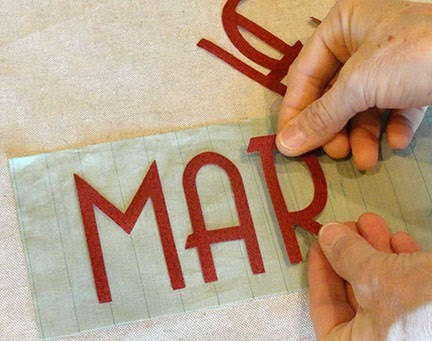 You can use a zigzag/satin stitch, or a blanket stitch (my preference). Step 6. As each "run" of over-edge stitching is completed, leave 1" to 2" tails. Pull the bobbin thread to bring a "loop" of the top thread to the backside, work the tail end all the way out at the backside, then tie a double knot and clip threads short. Step 7. 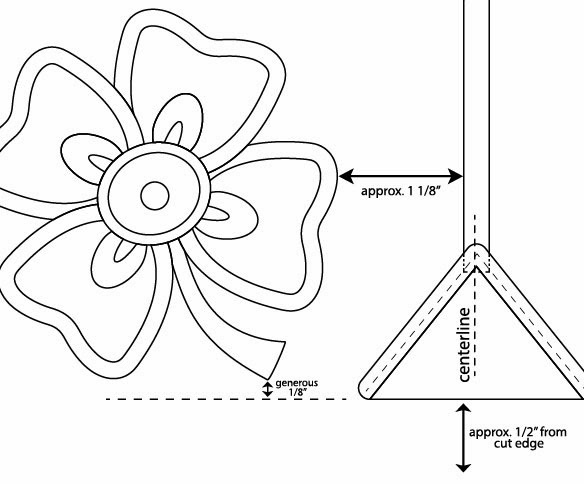 Mark the positions of the shamrock appliques to left and right of the center post using the measurements shown in the illustration at left. 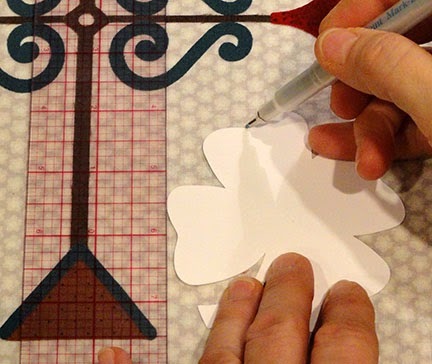 To make this easy, cut the "whole" shamrock shape from cardstock, then use it to follow the guide measurements from the image to trace the outline using temporary marking tool of some kind. Step 8. 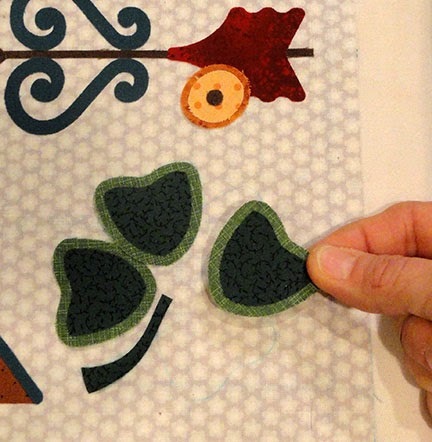 If you have an "Applique Pressing Sheet", you can pre-assemble/fuse the component parts of the shamrocks before positioning them over the marked outlines on the center panel. Otherwise, position the shapes onto the center panel, make adjustments then fuse in place. Follow this order: the outer petal shapes and stem, then the inner shapes, then the center base, then inner oval, then smallest oval. Step 9. 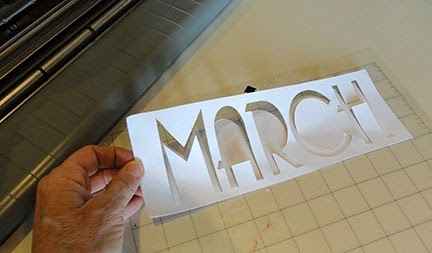 Prepare "MARCH" letters panel. 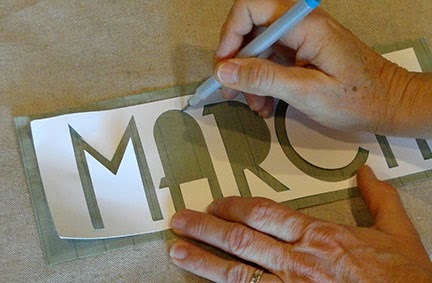 One way to ensure proper positioning is to cut the "layout" panel from cardstock as a tracing stencil, as is shown here. The stencil is centered over the front of the cut-to-size lower panel and strategic positioning guide marks at corners and extremities are marked with temp marker. Step 11. The rooster's eye shape is very small. If you prefer, you can paint the pupil instead of applique stitch it. 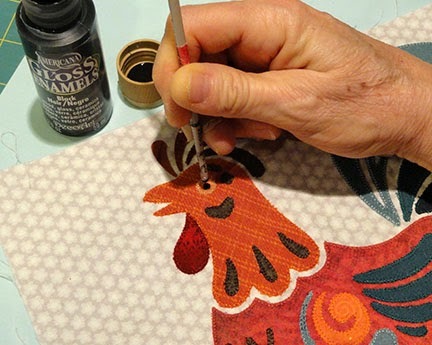 Here I am using the rounded end of a decorative paint brush dipped in black acryllic paint (dip from the lid) to make a "perfect" tutti-dot in the center of the outer eye applique circle. 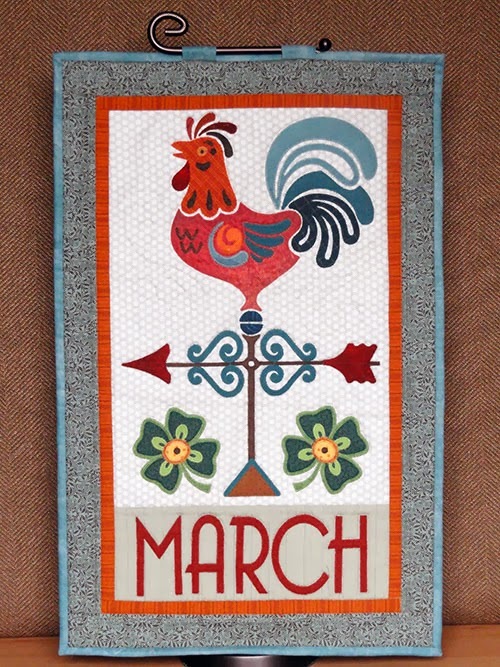 To finish your quilt banner, including adding borders, refer to the equivalent steps demonstrated in "January Calendar Graphica" post on this blog: http://needlesnknowledge.blogspot.com/2014/01/january-calendar-graphica-banner-quilt.html.